Ikoi Sushi is a new authentic Japanese restaurant in New Westminster that was first brought to my attention when it earned the status of "hidden gem" on Sherman's Food Adventures. It wasn't located in the most convenient of places for someone who travels mainly by bus, so I had been putting it off for a while. However, when food connoisseur LotusRapper recommended Ikoi Sushi to me, I decided to try the restaurant as soon as I could despite the transportation issues. Indeed, transportation issues abounded that day. The bus that I needed to take to get to Braid Station never arrived, and I ended up just walking to the restaurant from Braid Station since my timings were already messed up. When I opened the door to the restaurant, I was hit with the exquisite fragrance of a fish market. The fragrance became unnoticeable as soon as I sat down at my table, and instead, I quickly noticed that all of the other diners at that time were Japanese, which made for a more authentic experience. Ikoi Sushi takes their time preparing the dishes, and after 15 minutes, the first item to arrive was the Fire Dragon Roll. It was a spicy tuna roll topped with BBQ eel and special sauce. The tuna was soft and not overwhelmed by the small amount of chili powder that was used to make it mildly spicy. 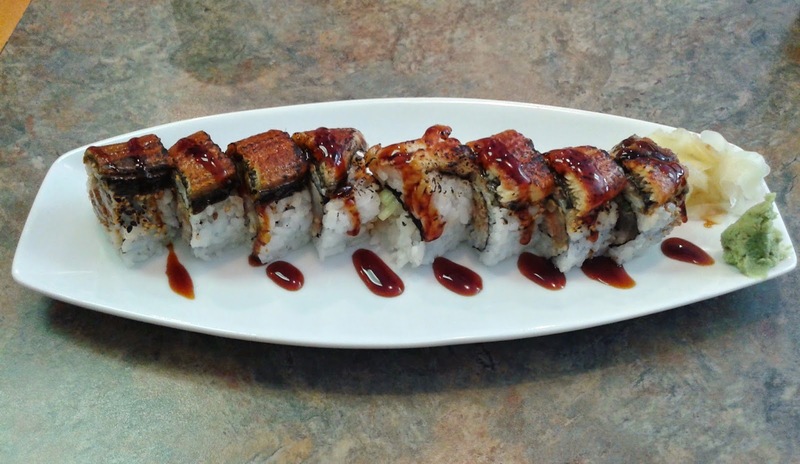 The unagi was deliciously seared and the sesame seeds added additional flavour to the roll. Next came everything from the Lunch Special D that I ordered. Well, everything except for the Miso Soup. I assumed that they were complying with the Japanese tradition that Miso Soup should be served at the end of the meal, so I didn't ask about it at first. 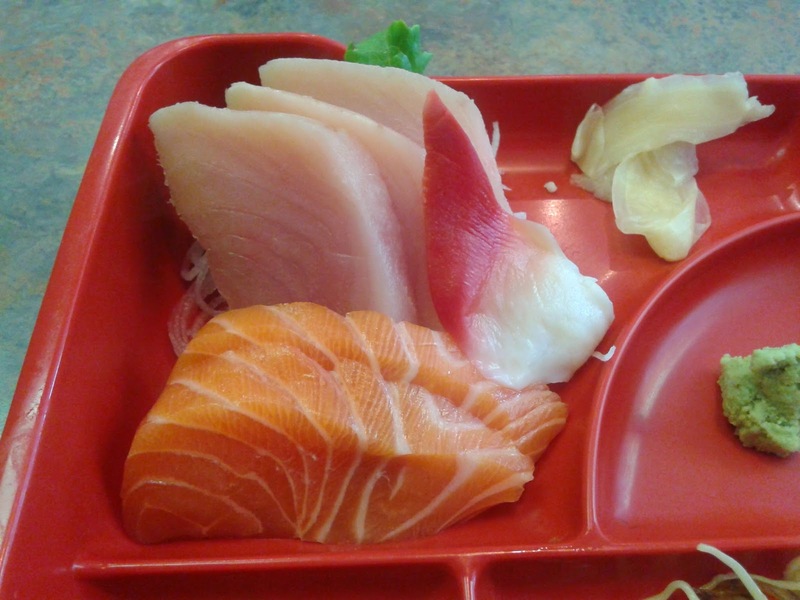 The sashimi was a delightful start to the lunch special. 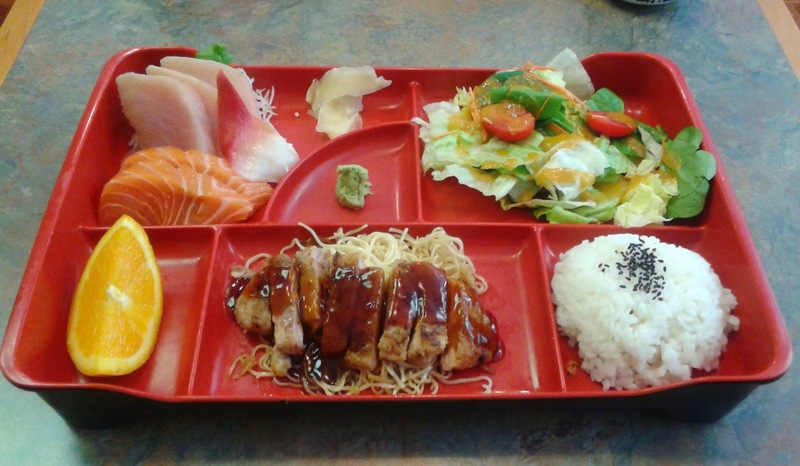 All of the pieces were presented neatly and tasted fresh. The tuna was soft just like in the Fire Dragon Roll and the salmon had a delicious buttery sweetness to it. The hokkigai was thinly sliced so that it would not be overly chewy. The Green Salad was served in a rather large portion for a lunch set. 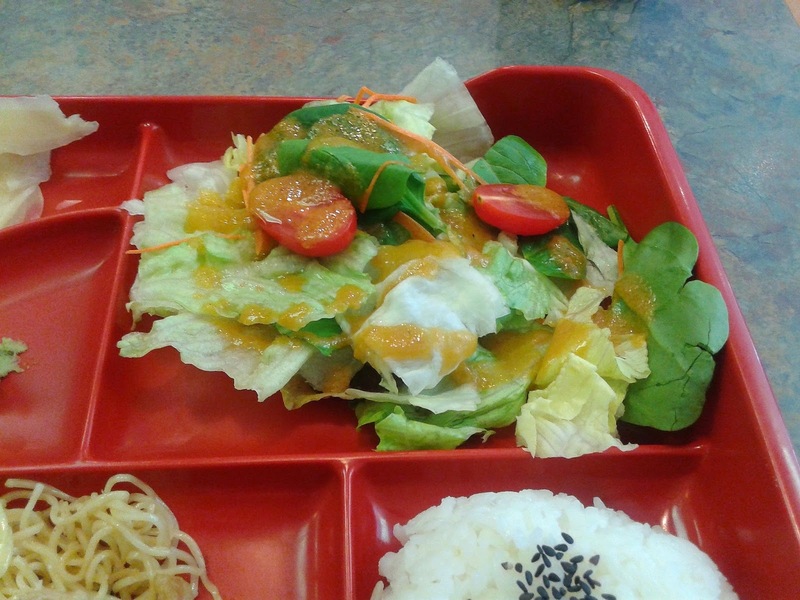 The lettuce leaves were dressed in a rather tangy Japanese salad dressing. There was too little of the dressing to provide flavour to the whole salad. 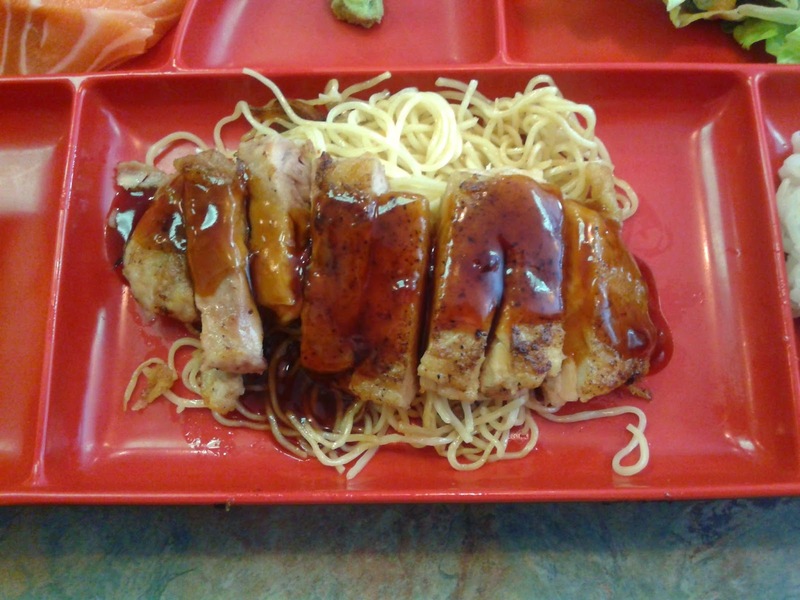 The tender chicken in the Chicken Teriyaki had a nice smoky flavour. Underneath the chicken was a thin bed of soba noodles that was very lightly stir fried. I enjoyed the softness of the noodles, but I would have preferred a bit more sauce for the noodles. After observing other diners, it became apparent that they had simply forgotten to serve me the Miso Soup at the beginning. I asked the server for the Miso Soup (she was really apologetic about it) and it was quickly brought to me. 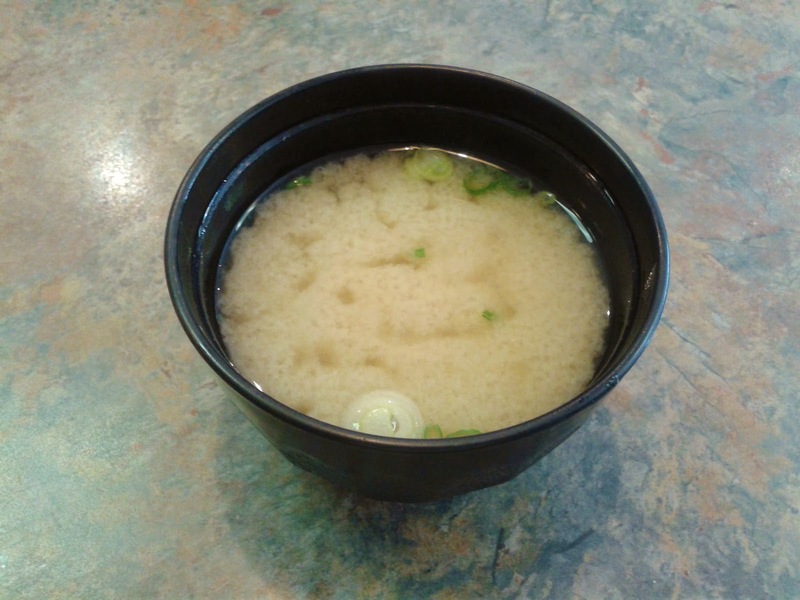 The Miso Soup was served at a nice hot temperature with green onion and tofu and it had a well-balanced mixture of dashi broth and miso paste. 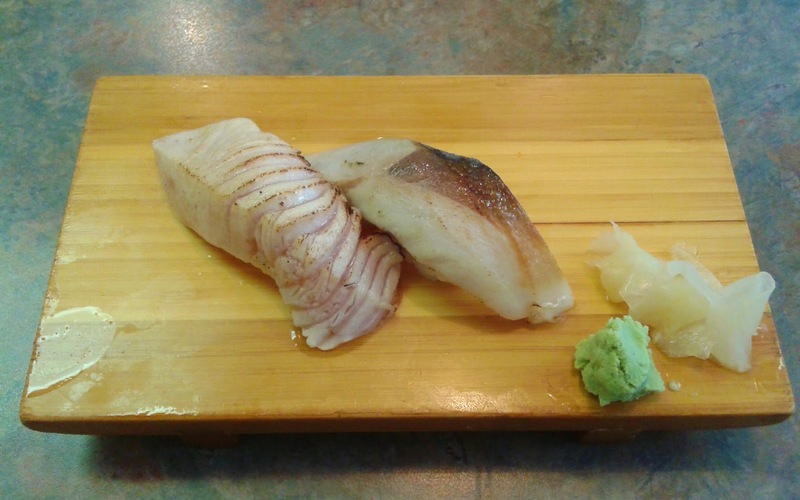 At Ikoi Sushi, Aburi (seared) nigiri is available for an extra $0.25. The Aburi Toro Nigiri was very juicy and came with quite a thick, generous cut. One corner of the toro was over-seared and ended up being a bit hard, but otherwise, it was decent. The saba was delightfully soft and successfully seared, while the sushi rice was well-made for both pieces of nigiri. The servers were quite friendly throughout my entire visit, though it got a little hard to get their attention once the restaurant became packed. Needless to say, when I tried to pay my bill at the counter, there happened to be 10 people in line trying to do the same thing! 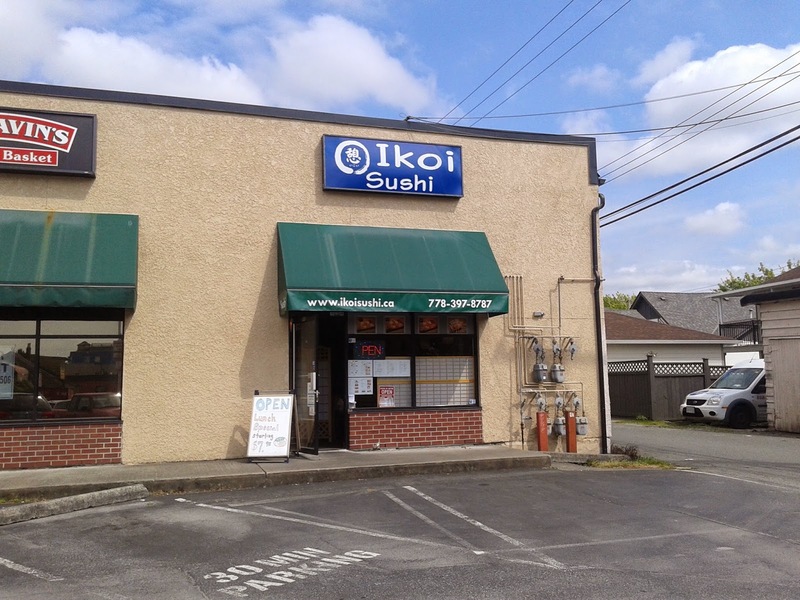 Ikoi Sushi is a nice example of how location isn't everything when operating a business. Affordable prices and well-prepared (as well as authentically prepared) food can work just as well. The food was definitely worth the transportation issues! Glad your lunch went well ! Yeah the lunch rush can be a bit chaotic there, but unless you have a tight lunch hour, its worth going there as you saw :-) I hope they stick around for a long time ! Haha I read many Vancouver-based food blogs and I've frequently seen your comments on them, so I believe that makes you a food connoisseur! I hope Ikoi Sushi sticks around too, because now I have two good places to recommend in New West (the other being Victoria Sushi).